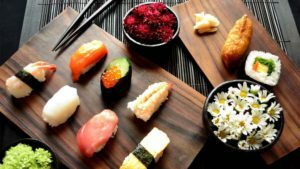 It is common that while eating we drop food and in order to save it from getting wasted, we catch it with our hand, But as far as Japanese culture is concerned, Catching food is considered bad habit. 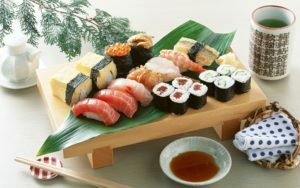 Instead of catching food with your hand it is considered polite to use a hand plate (Tezara in Japanese). 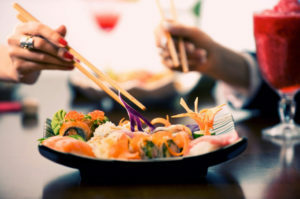 Mixing Wasabi with Soy sauce is improper in Japanese culture but people are seen doing it in many restaurants around the globe, however it should be avoided. It is better if you place a small amount of Wasabi on the piece of Sashimi and then dip the fish into the soy sauce and eat. It is a common practice everywhere that we take a bite from the food and keep it back on the plate. Well, it is taken for bad manners in Japanese culture. According to them you must eat the food in one bite and if not then cover your mouth with your hand while chewing big pieces of food. In Japanese culture, while eating food it is important that one picks up the bowl first and then the chopsticks. When you change bowl of food then you must put your chopsticks down first and then pick up the second bowl. After picking up the second bowl you have to pick up the chopsticks again. Frequently people put their chopsticks on the top of their bowls once they are done eating, But it is impolite in Japanese food etiquette. You should put the chopsticks on a chopstick rest or the wrapper the chopsticks came in. If both are unavailable the you place the chopsticks on the side of a tray but not on the top of the bowl. The backside of the chopsticks is not considered clean because it is where your hands rest and therefore it is not good to pick up food using that end. It is more polite to ask for a fresh pair of chopsticks and use them to pick up food.